Order your own copy of these Operative Expansions at your local retailer or online through our website today! 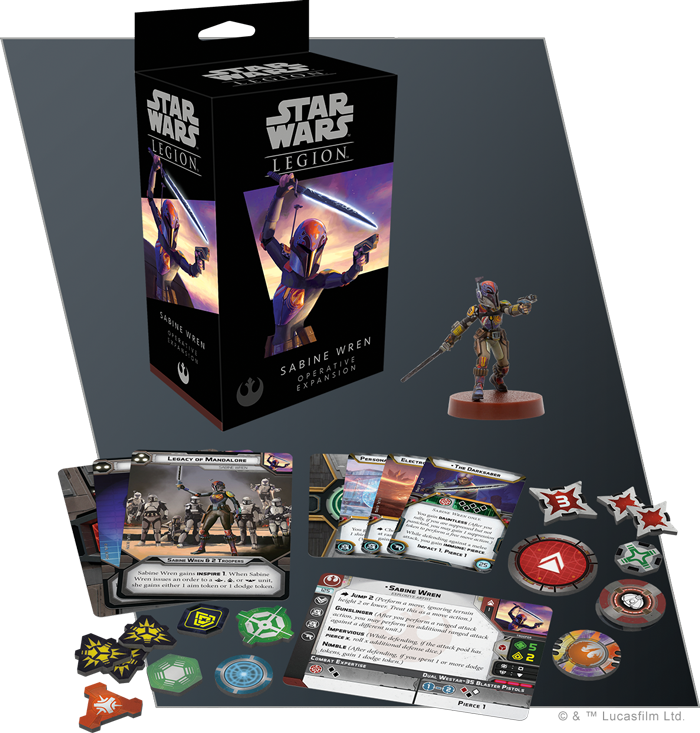 Whether fighting for family honor or in pursuit of their next big score, both Sabine and Bossk bring all their skills as bounty hunters to your armies, bringing with them creative solutions to common problems found on the battlefields of the Galactic Civil War. Featuring new command cards for each of these operatives as well as a variety of new upgrade cards to customize your armies, these Operative Expansions unlock deadly new options for both Rebel and Imperial players. Towering above most other beings, it’s not difficult to see how Bossk has gained a reputation as one of the most feared bounty hunters in the galaxy. Even more important to his work than his great height and reptilian features, however, are the natural Trandoshan hunting instincts he uses to track his prey across the galaxy. When in the employ of the Empire, Bossk will throw himself at any enemy that will earn him the most money, often turning his claws into deadly weapons after softening his target up with his Relby-v10 Mortar Rifle. With the ability to easily scale obstacles and shrug off damage, Bossk is sure to be a true terror on the battlefield. 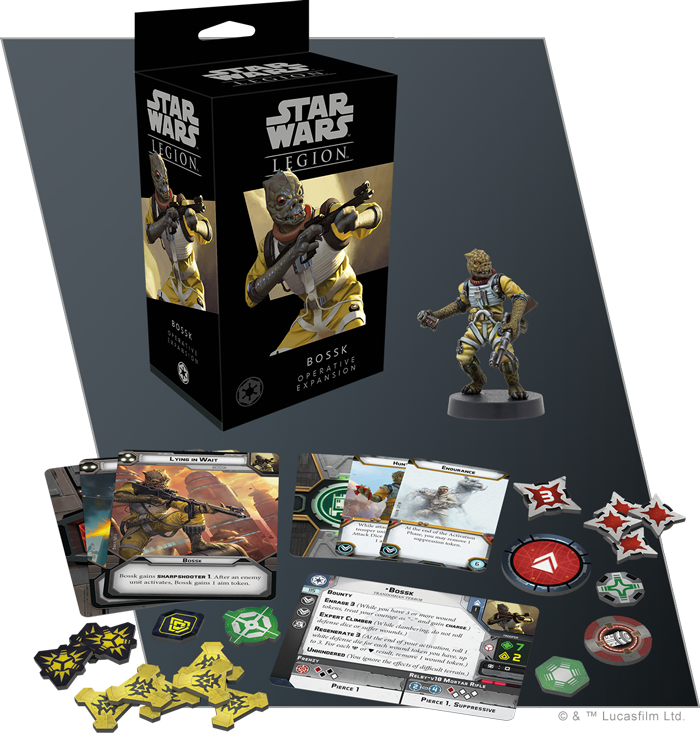 In the Bossk Operative Expansion, you’ll find an unpainted, easily assembled Bossk miniature armed to the teeth. Wearing his signature outfit and featuring two distinct poses (holding his Mortar Rifle raised, or preparing to throw a dioxis charge), this Bossk is sure to intimidate any opponent. Along with the unit card and upgrade cards that you need to fully outfit him for battle, you’ll find Bossk’s three signature command cards, giving you access to even more weapons and tactics exactly when you need them. We’ll take a look at everything included in the Bossk Operative Expansion, including all of his command cards, in a future preview! While they may find themselves on opposite sides of the Galactic Civil War, Sabine Wren and Bossk aren't all that different. Raised to be fighters and carrying with them a legacy of war, both are ready to play their part in this galaxy-defining conflict. 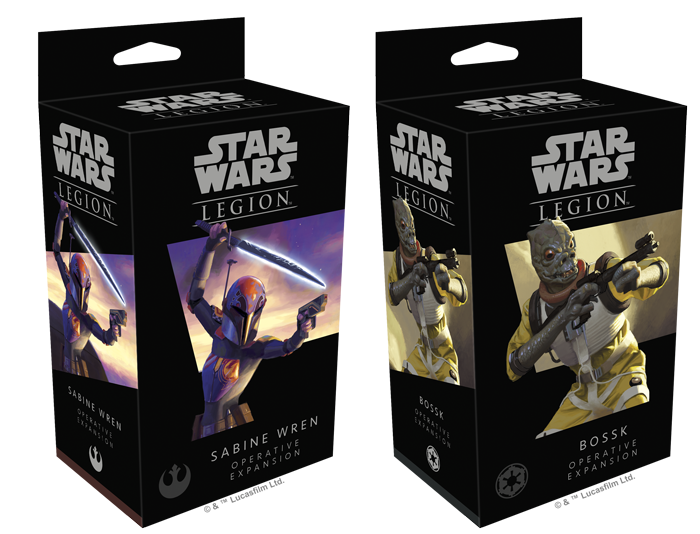 Look for the Sabine Wren Operative Expansion (SWL37) and the Bossk Operative Expansion (SWL38) at your local retailer in the second quarter of 2019. Pre-order your copy at your local retailer or online through our website here!